This is the first comprehensive publication on India's remote Northeast, the area comprising seven states stretching from Tibet in the north to Myanmar (Burma) in the south, among them Nagaland, Meghalaya and Assam. This area is known as "The Seven Sisters of India" - a region which for many years was closed to foreigners. 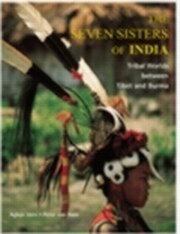 The Seven Sisters of India provides a detailed and balanced picture on the different aspects of life, religious belief and ritual. The geography of this region of contrasts, the origins of its people, their houses, the cult of the sun and the moon, ancestor worship, weaving, dance, beliefs connected to head-hunting and matriarchal structures are among those aspects given special attention. The Seven Sisters of India is the first comprehensive and up-to-date survey of the seven isolated and until recently closed to foreigners northeastern states of India lying between Tibet and Burma. The book examines the political and historical background of the seven states¾ Arunachal Pradesh, Tripura, Meghalaya, Nagaland, Mizoram, Manipur and Assam¾ including their local customs, religious practices, and ancient rituals. Over 400 full-color photographs offer a glimpse into the life of these remote cultures, from their traditional architecture and dress to their healing and hunting practices to their ancestral worship and matriarchal culture. In a region rarely visited by foreigners, numerous ethnicgroups continue a way of life unchanged for centuries. For example, in Arunachal Pradesh, many people practice polygamy. In Manipur, native people perform elaborate, ritual dances to honor village deities and in Nagaland, villagers worship the sun and the moon, to which they attribute human life. Surrounded by India, China, Tibet, Burma and Bangladesh, Northeast India is extraordinarily diverse, described by the authors as an "ethnological transition zone." The Seven Sisters provinces of India are inhabited by over 500 distinct ethnic groups, some of which have preserved ancient customs, shaman rituals and headhunting traditions. Through photographs and descriptions, The Seven Sisters of India documents the traditions and daily life of the diverse inhabitants of this region, examining the myths and folklore stories connected to present-day practices among different groups. The book discusses both the diversity of the groups and the common traditions which unite them, making for a fascinating exploration of the little known provinces of Northeast Indian. Peter van Ham and Aglaja Stirn have traveled extensively in northeast India over the past two decades studying the customs and environment of the native population. In 1996 they were the first western travelers allowed to enter the far northeastern states of India after a decade-long ban for foreign visitors. Their travels in India and Tibet have resulted in numerous lectures and articles, and several books.